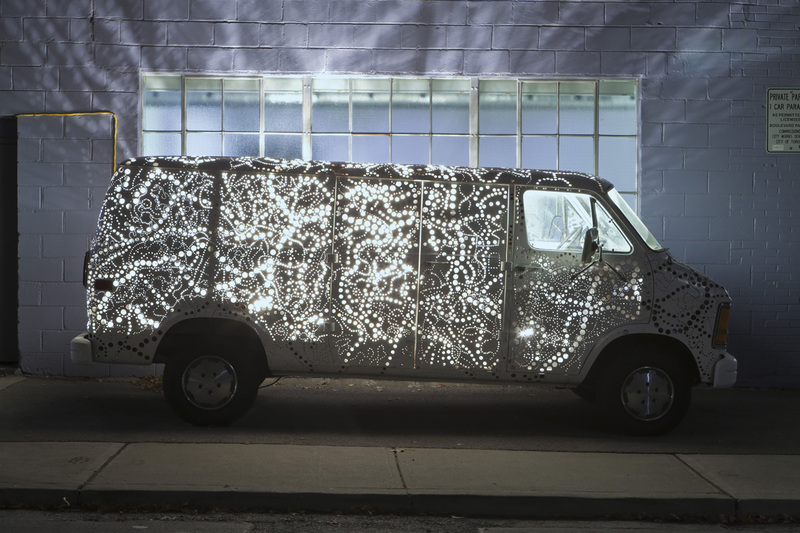 In the 2013 Nuit Blanche exhibit by Kim Adams bicycles function as metaphor for the to-and-fro of human communication and negotiation. dandyhorse will be at Nuit Blanche this year checking out all the bike-themed exhibits, especially the interactive exhibit by Kim Adams that features two-headed bike pairs that you can ride. We'll have photos and comments from participants following the all-night art party taking place this year on October 5. The Adams exhibit is part of a set of projects curated by Ami Barak for Nuit Blanche called, "Off to a flying start" and is an Dada-esque bike-themed exhibition, which will be concentrated in and around Nathan Phillips Square and Toronto City Hall. 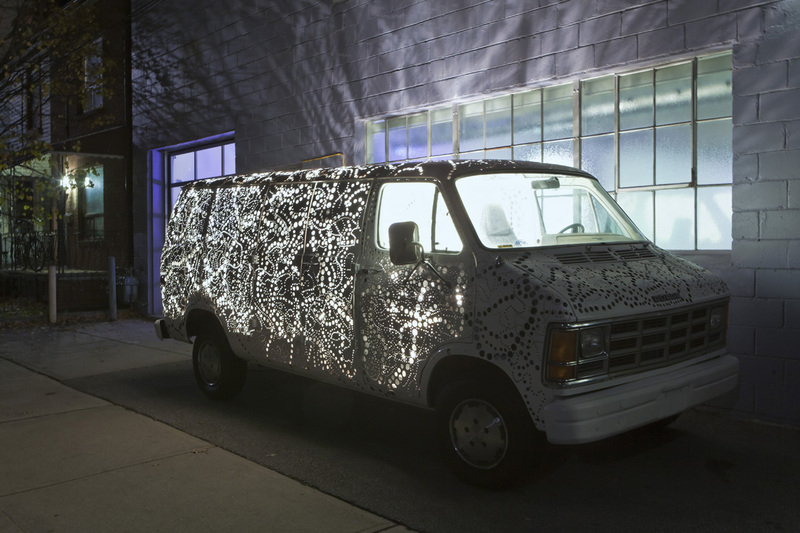 "Toaster Work Wagon" was originally commissioned by the international InSite Biennial (San Diego, 1997) and has since been purchased by a museum. So another wagon will be on site with the bikes this year. 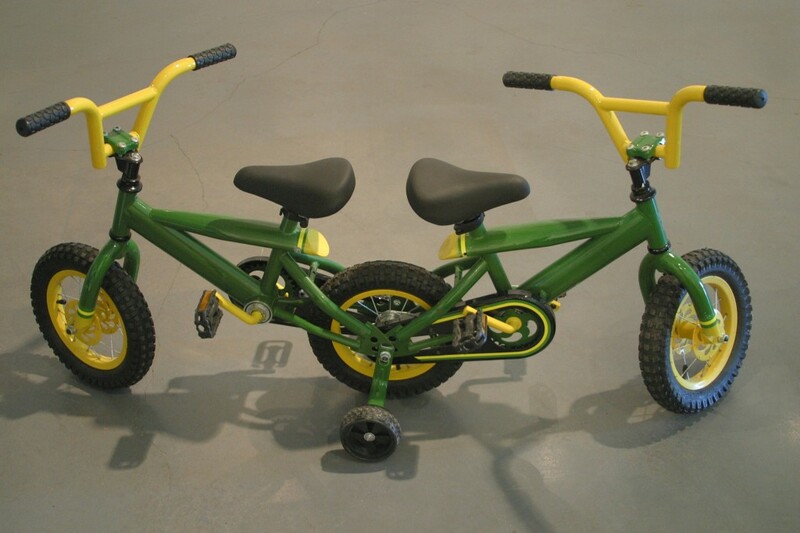 The exhibit features a group of various-sized bicycles that have been modified and made into double-headed pairs. Mounted back-to-back, participants can test ride the bikes by negotiating with each other who will take the lead. The vehicle and bicycles function as metaphor for the to-and-fro of human communication and negotiation. 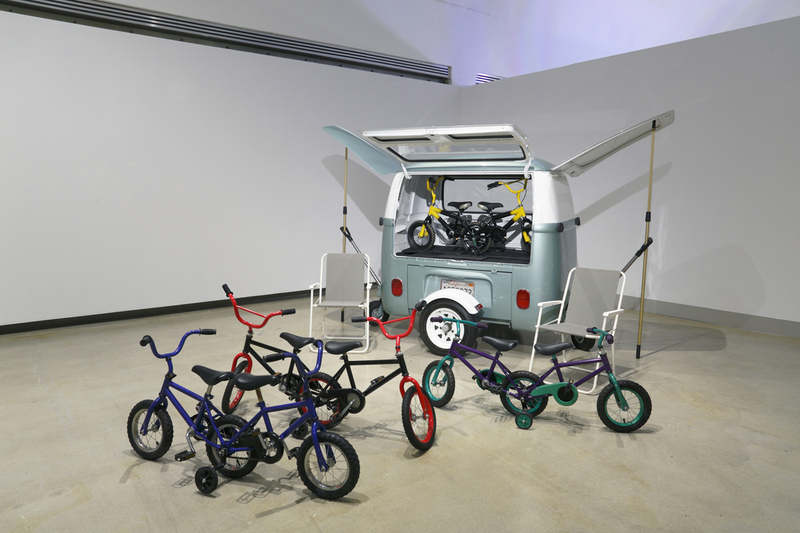 This is the first time the artist has used adult-sized bicycles in the exhibit, which he's been showing in various forms since the early-to-mid eighties. Adams says he made the first two-headed tricycle for his niece and her friends to play on back in the early 80s when she was two-years-old. He conceived of the sculpture "by accident" when he was waiting for a tardy curator at the mall where they were preparing a toy land display for Santa and his elves. Adams says there were so many bikes and trikes and the way they were arranged in the display made them appear two-headed. When he examined the "simple" mechanics he thought he could "fix it" to make the bicycle pairs in which one person would steer and the other would pedal. It was in 1997 when Adams switched from trikes to bikes for a show in Tijuana. "They take a little more effort to ride," he says, adding that the crank is also now left on so that both participants can pedal, whereas the original design had just one "pedaller". "We usually make 10 per show and give away eight and keep one for the collection," he says. "This is a bit different with Nuit Blanche, so we wont be giving them away - there are just too many people. This is also the first time we will be using adult-sized bikes." Adams' brother-in-law from Germany is an engineer (now semi-retired) who assists in the building of the bikes and used to design and build wind turbines. Adams has also done other car-themed exhibits that might suit the taste of the dandy readership: here's one below from a previous Nuit Blanche where Adams drilled thousands of holes into a 1985 Dodge Ram and then lit it up. "Once you put a hole in a car the whole culture changes. When I bought this can in Chicago the guy from the dealership asked to come and see me do the work. So I called him up and when he saw me drill the first hole, he put his hand on my shoulder and said "The warranty is over." You drill a hole in a car and it means you are destroying it. Especially when you buy a brand new [SUV]... some people were yelling at me and wondering what I was up to." Adams rides a bike in Germany and Holland and now-and-then near his east end home in Toronto, but says he's not really prepared to negotiate what he calls "pretty hairy stuff" that cyclists face in Toronto's streets. He says this Nuit Blanche kind of feels like a "big birthday party." Adams also has a show at the AGO right now. Learn More about Kim Adams at Diaz Contemporary. Another notable, world-renowned artist in this exhibit: Ai Wei Wei. 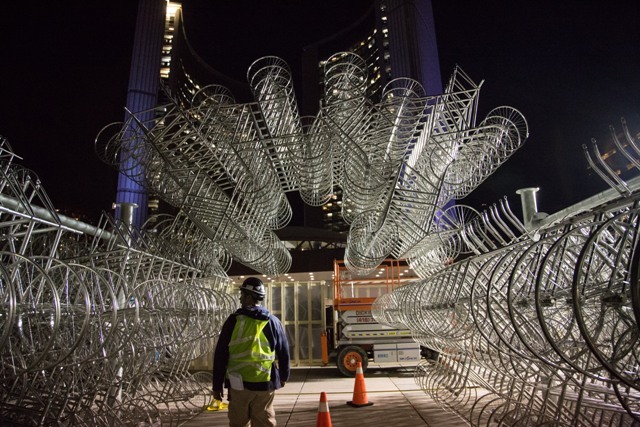 A new edition of his sculpture Forever Bicycles at Toronto's Nathan Phillips Square. Above image of the building of Ai Wei Wei's "Forever Bicycles" exhibit, at night on Nathan Phillips courtesy of Sue Holland. Curator Ami Barak's statement: "In 2013, we celebrate the centenary of Bicycle Wheel, Marcel Duchamp's first readymade. He combined a bicycle wheel and a stool - and it has become central to the very notion of Art and the artistic attitude towards objects. This century, objects found in the streets, chosen by artists, are displayed in museums. In the context of Scotiabank Nuit Blanche, when the entire city becomes an open-air museum for one night, we will take these objects back to the streets and reunite the public with the ubiquitous nature of the artwork."